Ed Kopetsky is Chief Information Officer of Lucile Packard Children’s Hospital Stanford and Stanford Children’s Health. The hospital is the highest acuity children’s hospital in the country, and the health system is the largest in the region devoted exclusively to caring for children and expectant mothers. Since becoming CIO in 2009, Ed has led large-scale changes in healthcare and enterprise systems. In 2014, he completed an industry-leading, three year implementation of modern enterprise systems to support integrated patient care, high-performance business and analytics systems, and new web technologies to connect patients and consumers. In 2015, Lucile Packard Children’s Hospital Stanford and Stanford Children’s Health received the Healthcare Information and Management Systems Society (HIMSS) Stage 7 Acute Care and Ambulatory Awards, given to hospitals and health systems that demonstrate best practice for electronic patient records use and adoption. The organization was also awarded Most Wired Hospitals by the American Hospital Association and College of Healthcare Information Management Executives. 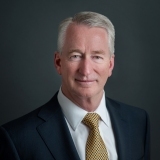 Prior to his current role, Ed was a partner at IBM Global Business Services and Healthlink, a consulting firm specializing in healthcare IT and process improvement (IBM acquired Healthlink in 2005). In the early 1990s, Ed implemented one of the first integrated patient care systems supporting a multi-hospital and physician network at Sharp Healthcare. He later helped lead the integration of Centura Health, the largest health system in Colorado. Ed has contributed nationally and locally to numerous professional organizations, including serving as a founding member and Board Chair for the College of Healthcare Information Management Executives. He has served on numerous company advisory boards including Dell, Hewlett-Packard, Encore, Next Wave Health Advisors, and CHESS Mobile Health. He is currently chair of the industry advisory board for the University of Wisconsin-Madison Department of Industrial and Systems Engineering. In 2013, Ed was named one of the top 20 CIOs driving change in the U.S. healthcare system by Healthcare Information Week. In 2014, he was presented the Distinguished Achievement Award from College of Engineering at the University of Wisconsin-Madison. He was recently awarded the CIO Lifetime Achievement Award by the Silicon Valley Business Journal, San Francisco Business Times and PwC. Ed grew up in Wisconsin and earned his bachelor’s and master’s degrees in industrial and systems engineering from University of Wisconsin-Madison before moving out to California where he currently resides. In his free time, Ed enjoys time with his family, golfing and bicycling.